1. Preheat the oven to 190°C, gas mark 5. Grease and line 2 x 18cm round sandwich tins. 2. For the buttercream, whisk the Lurpak Baking until pale and gradually whisk in the icing sugar and vanilla extract. Cover and chill. 3. For the sponge, whisk the Lurpak Baking with the sugar until pale and fluffy. Whisk in the eggs one at a time. Mix the flour and baking powder together and fold into the butter mix. Spoon into the tins and smooth. 4. Bake for 20 minutes until golden and springy to touch. Remove from the tin and cool on a wire rack. 5. 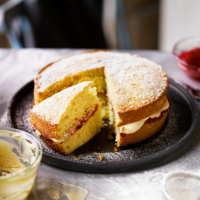 Place one of the cakes on a serving plate and spread with jam. Spread the buttercream on the second cake and place on top. Dust with icing sugar and serve.